Circle of Life - Malaysia Beauty and Lifestyle Blog: Event: Boyce Avenue LIVE in KL!!!! 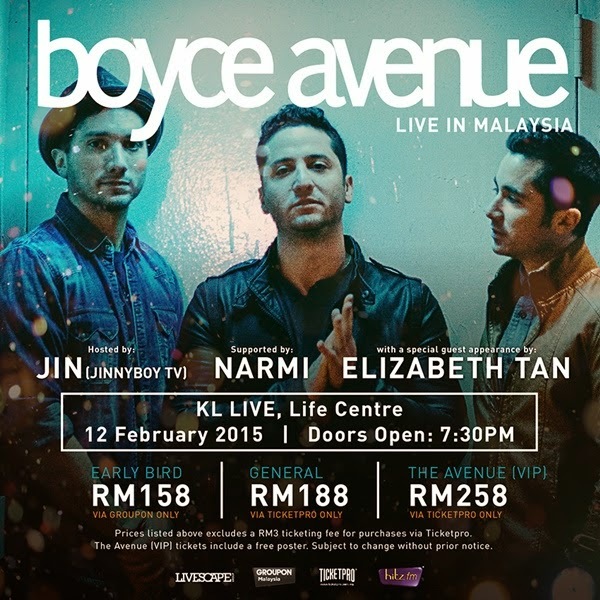 Event: Boyce Avenue LIVE in KL!!!! Yes, you saw it right, Boyce Avenue will be heading to Malaysia as part of their Asia Tour which will be held at KL LIVE on February 12. Organised by The Livescape Group, the one-night-only show is set to attract over 2,000 fans in what will be their first ever appearance in the country. I've got my tickets and if you haven't you better go get them now!!!!!!!!!! The band is made up of brothers, Alejandro who sings lead vocals, plays the guitar and piano, Fabian who plays the guitar and sings backing vocals, and Daniel who plays bass, percussion and also sings backing vocals. The brothers formed the band in 2004 and have been producing videos and sharing their original music as well as covers of popular songs on YouTube since 2007. The band boasts over 6.5 million YouTube subscribers, 1 billion total views, and over 290 videos on their main YouTube channel BoyceAvenue. They have also collaborated with other YouTube artistes such as David Choi, Kina Grannis, Alex Goot, Hannah Trigwell, Tyler Ward, Fifth Harmony, and many more. Is there any other reason you need to go hear these guys live?!? i've always wondered how the name Boyce Avenue came about. Apparently it was derived from two street names which the brothers used to live on when they were younger. Not very original, but hey, the sensational trio are among the first few internet celebrities to create music-focused channels on YouTube and have since gained a large number of subscribers on their respective YouTube channels.